Take a walk in downtown Manhattan, and you will quickly see signs of construction everywhere: scaffolds, barriers, cables, and signs make these streets look like an obstacle course. In fact, there are so many of these construction sites, that it has been creating a quality-of-life problem for businesses and residents in the area. Last year the Downtown Alliance and the LMCC launched a pilot project, inviting artists in New York City to propose ideas for making these sites look better. The Re:Construction program, as it came to be known, called for construction sites to be used as canvases for innovative art and architecture, hoping to improve the visual chaos. This resulted in three new art projects, on view in different locations downtown. 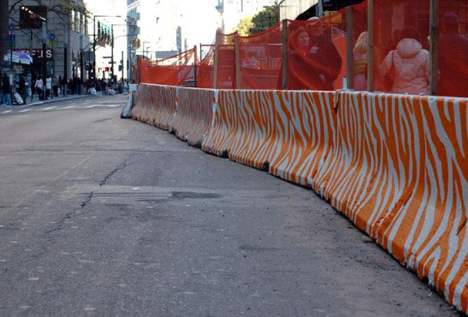 Concrete Jungle by Tattfoo Tan is an array of concrete barriers that transform their orange warning bands into a zebra pattern. This intervention is on Broadway between Fulton and John Streets. Best Pedestrian Route by GRO Architects is on the sidewalk of John Street and Broadway. 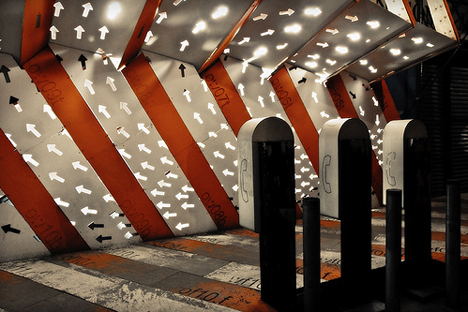 It is an innovative shelter-like structure that plays with the orange and white colors of construction signs. Fulton Fence by Carolina Cisneros, Carlos J. Gómez de Llarena and Mateo Pintó can be found on the corner of Broadway and Fulton Street. 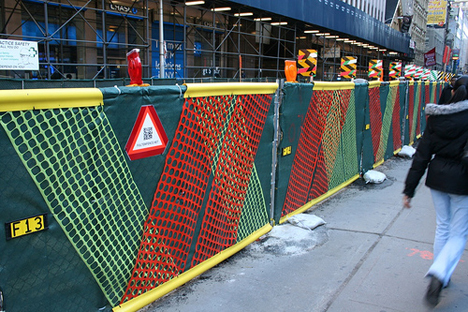 This is a long fence covered with a dynamic collage of plastic meshes and taped signs. It also has QR-code signs that allow mobile users to visit an online counterpart to the physical site. This pilot program proved successful with city officials, neighbors and the media. The Re:Construction program plans to support a series of similar projects in the next few years.